BEACON empowers students to discover their innate ability to succeed! Their goal is to provide a great, fun, enriching, safe, and healthy place for kids during the critical after school hours. Volunteers are need for enrichment clubs throughout the school year, as well as for the fundraising season from November through February. Anyone over the age of 18 is welcome to apply. 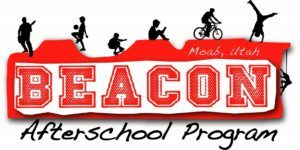 Call BEACON at 435-259-2767 or visit their website at www.moabbeacon.net/volunteer.html to get an application and attend a volunteer training.